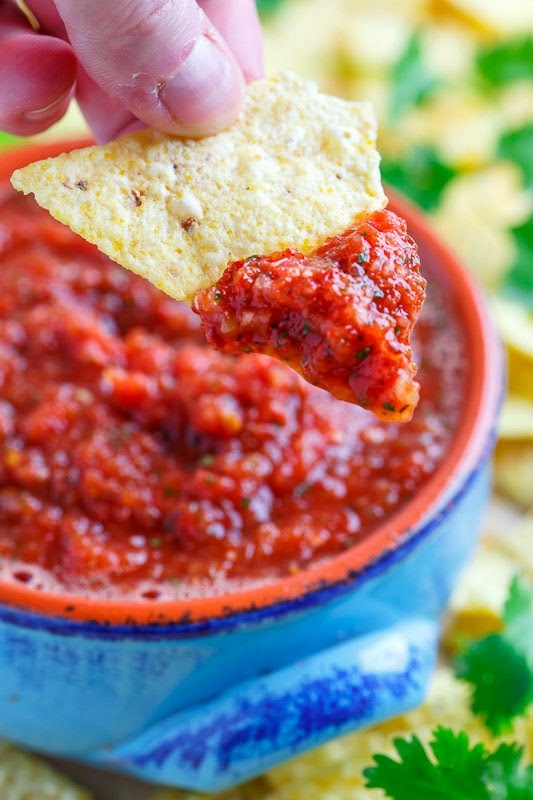 A quick, easy, tasty and healthy homemade pantry fire roasted tomato salsa (aka restaurant style salsa). 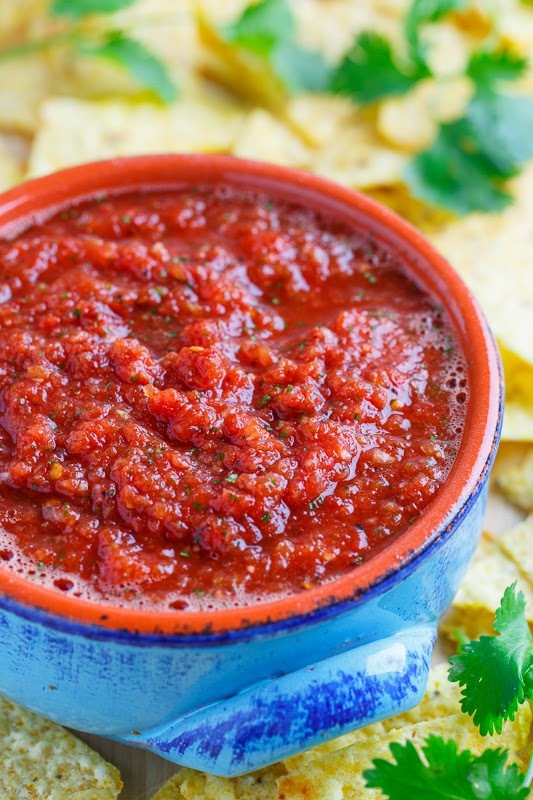 Salsa is a staple in Mexican cuisine and I realized that I had not shared my go-to quick, easy, tasty and healthy fire roasted tomato salsa, aka restaurant style salsa. 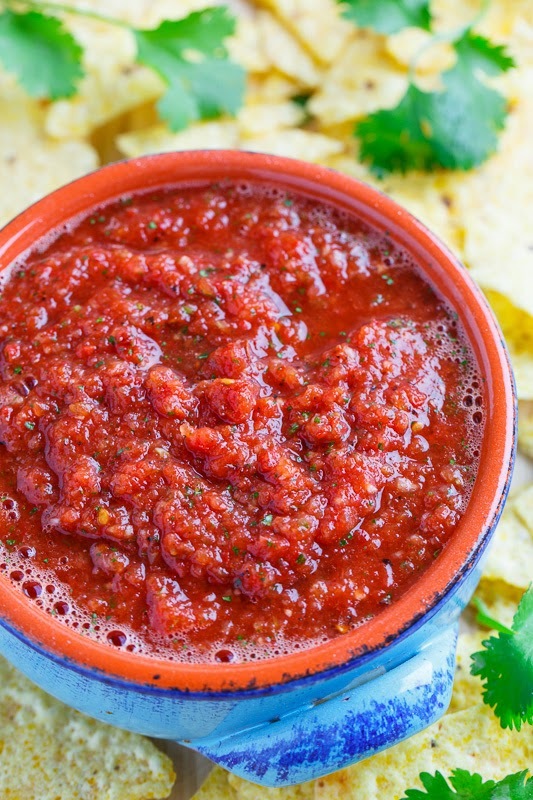 This salsa literally only takes 5 minutes to make and it’s pantry friendly! You just need to open up some cans of fire roasted tomatoes, throw them into a food processor along with some onions, garlic, chillies, lime juice, cilantro, salt and pepper and process until you have the desired consistency! Other than the cilantro I have all of the ingredients in my house pretty much all of the time so a tasty salsa is only ever a few minutes away! I like to use chipotle chilies in adobo sauce for the chili heat because they add an amazing smokiness but you could use whatever chilies that you prefer to get the flavour and heat that you desire! Puree everything in a food process and enjoy! Option: Replace the chipotle chili peppers with jalapenos, serrano, poblano, etc. for different flavours and amounts of heat. Oh wow!! So bright and pretty. I've always wanted to make my own salsa! I have all of that in my pantry right now. I even think I have some cilantro in the frig! Making it tonight! Kilyena: Which salsa recipe were you looking for? 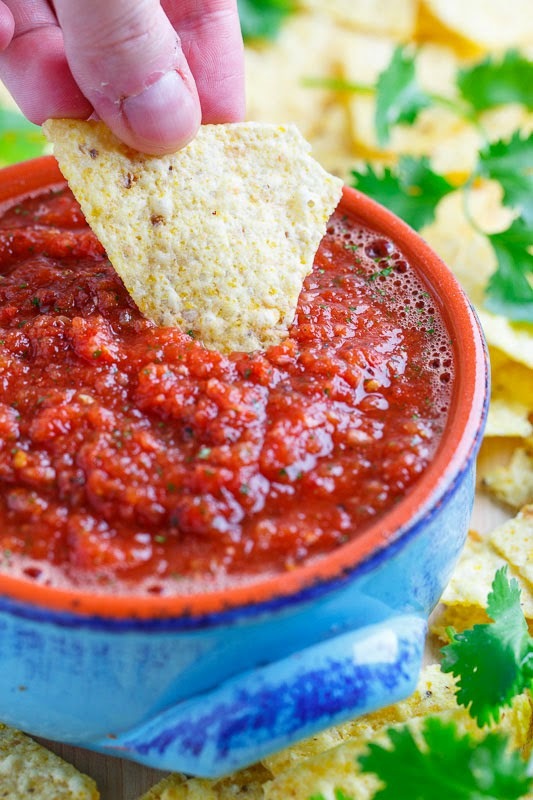 No jalapeno's in this salsa recipe? Did you mean to leave them out? I usually add about a tablespoon of sugar to the salsa though. But not sure how it will work with the chipotle peppers though. Just gonna have to try it! Kilyena: I like the chipotle chilies for the smokiness but fresh jalapenos are also great! It was a salsa recipe I got from your site a few years ago. I have it in my recipe book with Closet Cooking on it. I slightly modified it but it came from your site. Think it was titled Fresh Salsa. Honestly the only thing I think I changed was I added some sugar and extra onion (some pureed and some chopped for texture). I always get the best compliments on it and I always tell everyone its from Closet Cooking! It's pretty much the same ingredients as this one but without the chipotle peppers, you had jalapeno's instead and some cumin. 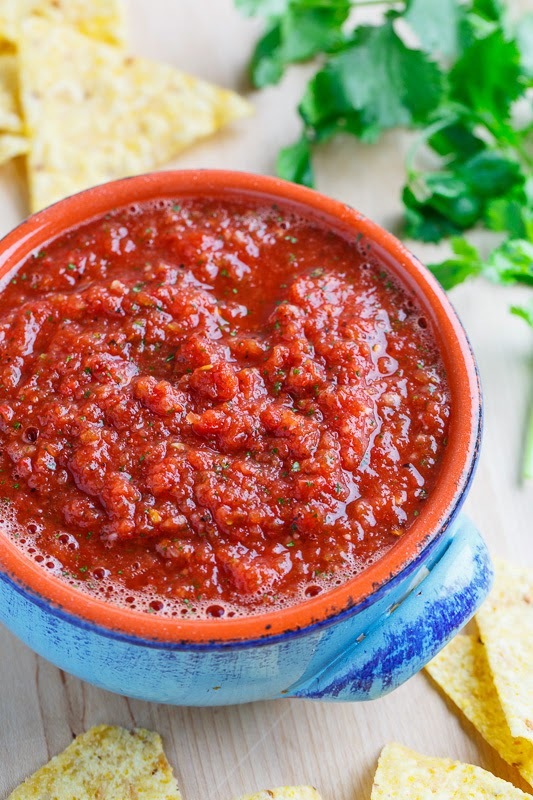 I have made this recipe many times and it really tastes like restaurant salsa. Love that it uses year round grocery store ingredients so it can made any time.